Two weeks ago, my sister told me she went for dim sum and since then, i’ve been craving for it. But I am poor (so no high class place for me), and lazy to queue (so no popular places). Then I read on HGW about Dim Joy, which Justin Kan reviewed. Who is Justin Kan? I dunno him, a stranger I like to do body shots on! Look at his body. So J. K. said that the place is opened by Michelle Saram leh! My friend and I were looking high and low for the restaurant only to discover that it is where all the gay bars are. It’s just beside Tantric (gay bar for SPG, Sarong Party Gays) and opposite DYMK, Lockerroom, and Taboo. Dim Sum restaurant among gay bars—the food had to be good right?! WRONG. But I’ll come to that later. I always like the decor of these rows of shophouses, with a front yard. So in the front, there were wooden round tables and chairs, very oriental and relaxing. But since it was raining, we couldn’t sit there and we went inside. The decor inside was cheap and tacky, with plastic tables. And we were the first customers…the waiter sat us beside a refrigerator giving out heat. Seriously, is the restaurant so cramped for space they have to put a refrigerator in the dining area? Then, as a waitress was walking to our table, she slipped and fell on her bottom, breaking the glass cups she was carrying. The glass bits were all over the floor and some even reached my feet but the servers only swept the area where she fell. Customers wearing flipflops (such as I) could easily step on the glass bits. So the waitress recovered to bring us another pot of tea – and she just left it on the table. Never in my entire life of going to Chinese restaurants do I have to pour my own tea. No service charge here is it? I mean, I’m sympathetic. I understand she just fell, and was probably hurt. But why can’t the other idle servers serve the tea instead? But other than this, the service was ok.
And the tea. Bland as hell. Not enough tea leaves. 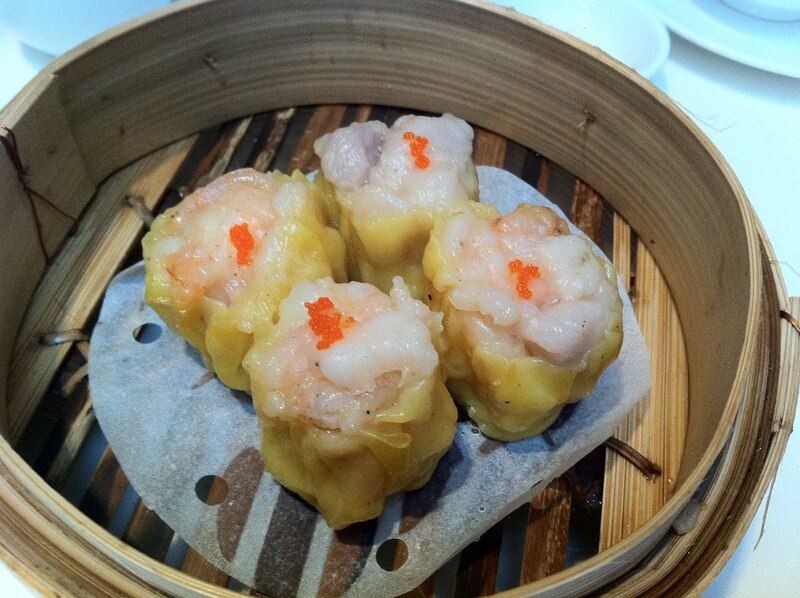 King Shrimp Har Gao (Dumpling). $4. I have never eaten a bad har gao until now. The skin sticked to the paper, which shouldn’t be the case. 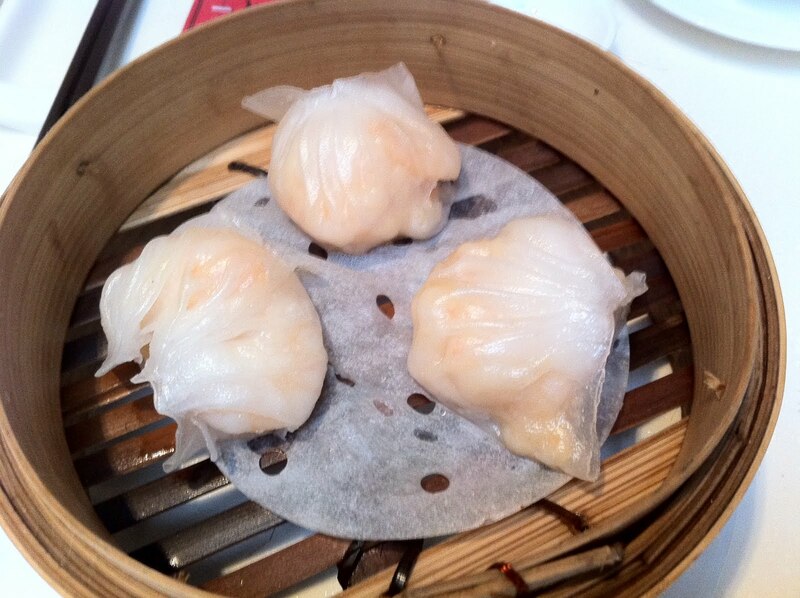 In each dumpling, there were two prawns. That’s it. 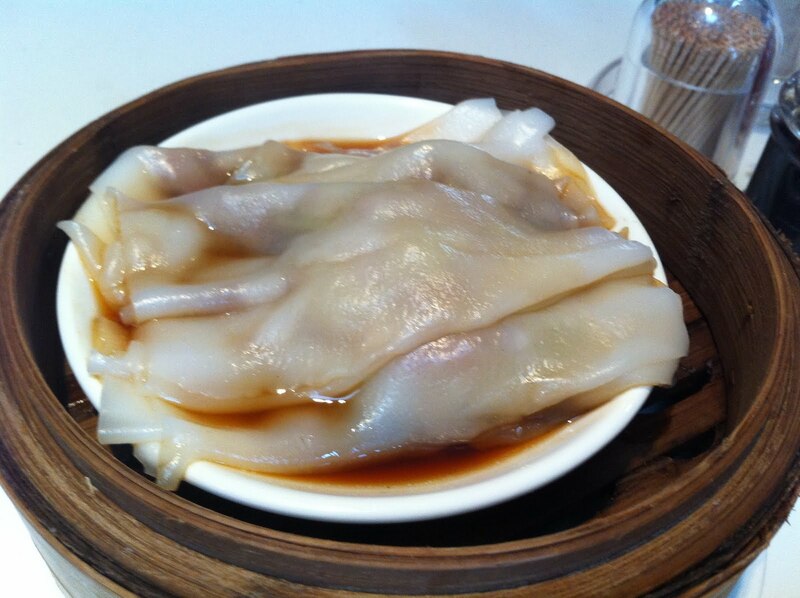 So the dumplings were tasteless, the skin was thick, over-chewy but tore easily. I didn’t have my lunch, it was 5pm and I was starving but after eating it, I told my friend he could finish the other two. 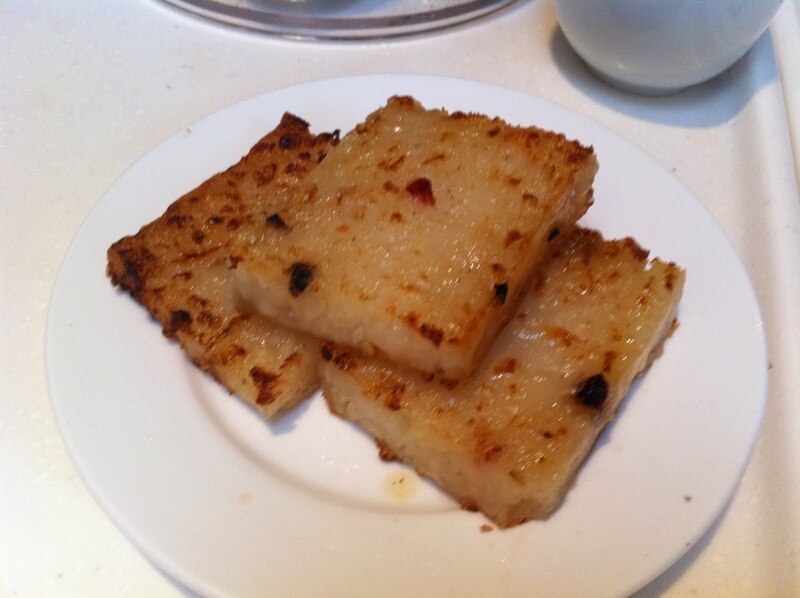 Pan-fried Raddish Cake. $3.50. Supremely oily but no taste again. I ate half of a slice and told my friend he could finish it. Ran out of salt in the kitchen? Were the Siew Mais ($3.50) even fresh? If you see the photo closely, you can see some graying of the siew mais, looking as if they had been sitting around since yesterday. And again, no taste. Like the skin of the har gao, this bbq pork in rice-skin ($5) broke so easily. Good dim sum don’t break. They are soft, supple but they don’t break. This one isn’t soft, isn’t supple, but it breaks. And despite all that soy sauce, there was no taste to this. 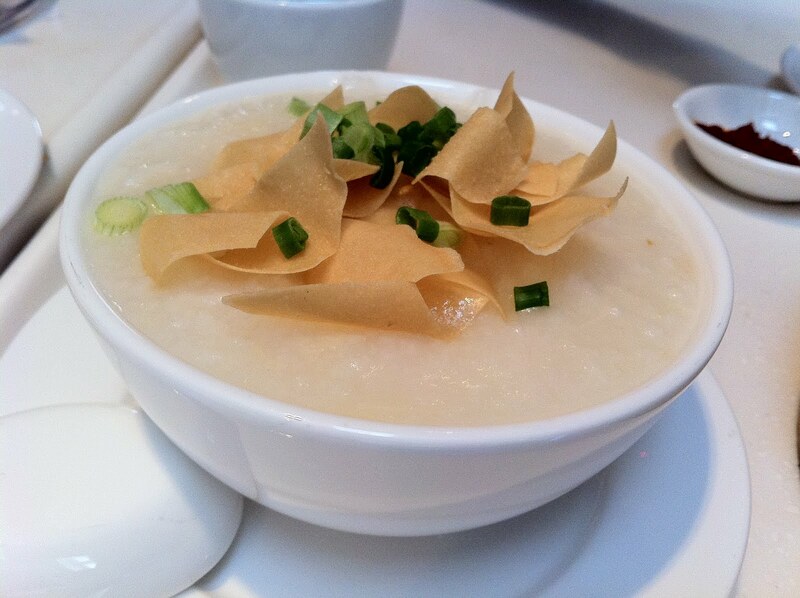 Dry Scallops Congee ($2). The thing about dry scallops is that they are not as expensive as life ones but they sweeten the soup/broth/porridge very much. But this one was crap. It was water and rice and 3 threads of dry scallops. Seriously, I ordered congee, not teochew porridge. The rice in congee is supposed to be so mixed into the broth that the congee is to be a broth. And again, no taste. At this time, because I was starving, and the food was so bad, I just threw my chopsticks on the table and said, “I don’t want to eat anymore. You finish.” My friend said he had never seen me so angry before. He said next time we should only eat good food. Chinese restaurants are very pan-dang. So you must have a good name for the restaurant. Dim Joy is an apt and inauspicious name because “dim” means “little” and there is very little joy here. The only joy I have is: Justin Kan, you owe me a massage for deceiving me!